Devoted Quilter is three years old today! I have so loved being a part of this online quilting community. It is amazing to me that I now have so many quilting friends, even if I've never actually met most of you! Maybe someday, right? 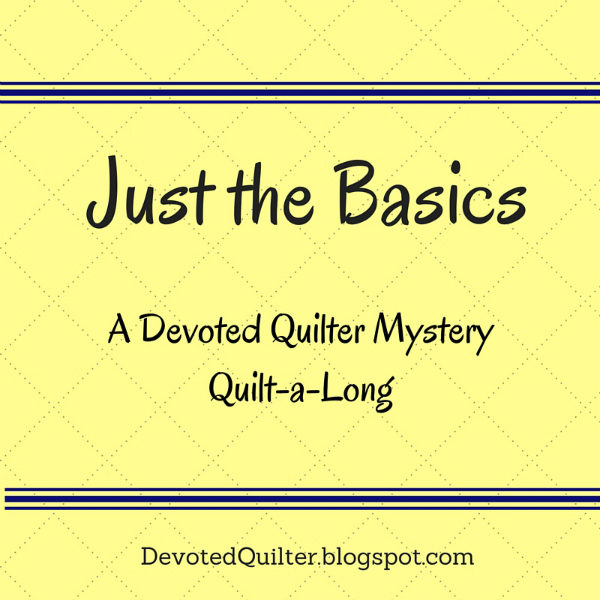 Starting the Just the Basics mystery quilt-a-long on my blogaversary seemed like a great way to celebrate three years of blogging. I really love the quilt I've made with this pattern, and I am excited to finally start sharing the instructions! Instructions for each part of the mystery will be posted here on my blog, with new instructions posted the first Wednesday of each month. You can follow my blog with Bloglovin, Feedly, or by email so you never miss a post. The links for all three methods are on my sidebar. I debated what size to make the mystery quilt as the original that I designed finished at approximately 48" x 48". That's a great size for a baby quilt or a wall quilt, but not everyone wants to make baby or wall quilts, right? Then again, not everyone wants to make a big quilt every time, either. So, I decided that I would offer two size options - the 48" x 48" size and a throw size that will finish at approximately 60" x 72". The pieces will be cut the same size for both, the only differences will be that anyone making the throw size will need more fabric and will make more units each month. I'm looking forward to seeing your quilts come together, so, if you're on Instagram, please share your progress pictures using #JustTheBasicsMysteryQuilt. 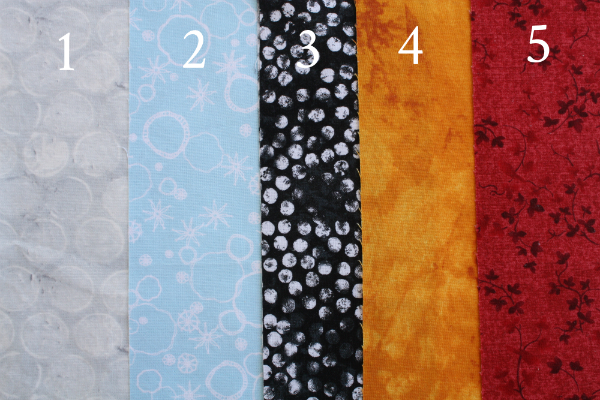 The Just the Basics mystery quilt requires 5 fabrics, which I will be calling Fabrics 1, 2, 3, 4 and 5. I recommend small to medium scale prints. Most of the finished pieces will be on the smaller side, so a larger print would likely be lost in the piecing. Don't be scared off by the prospect of small pieces, though! We'll be making units larger than needed, then trimming to size to increase our accuracy. I'll have extra tips for trimming accurately as we make each of the units, as well. To help you with your fabric selection, here is a picture of the fabrics I have used for my quilt. There are several possible focal points in the design, so I'm very interested in seeing how different fabric selections will affect the look of the finished quilts. Your quilt-a-long homework for this month is pretty simple - decide what size you want to make and gather your fabrics. I can't wait to see what fabrics you choose! Remember to share your fabric pull pictures using #JustTheBasicsMysteryQuilt. In April, we'll start cutting and sewing units together! Happy Blogaversary!!! I think a mystery quilt is a great way to celebrate! Here's to many more year of quilting, writing and sharing. Really like this idea and intrigued by your colour choices - will happily follow along! Do all five fabrics touch in the quilt top? Just trying to figure out how well the fabrics have to play together. Any suggestions on light, medium, dark???? Fabric 4 only touches fabric 3, so in my picture, the orange only touches the black. All of the other fabrics touch each other. As for light, medium and dark…there are 4 possible focal points in the quilt, so I don't want to recommend any particular fabric be light, medium or dark. I would just suggest you have some of each. I'll try to follow along. I'm a beginner so we'll see how it goes. I'm glad you're joining in, Kristin! I'm replying here because you're a no-reply blogger. If you have any questions, feel free to ask! I stumbled into this BOM far too late and I'm okay with that... What I really want to find is a BOM ( or week) that is just starting! All the ones I find are nearly done. Any suggestions?? ?